Here “He” is. Welcome Frank to the world. Frank marks Day #1 of the Pet in a Jar Project. 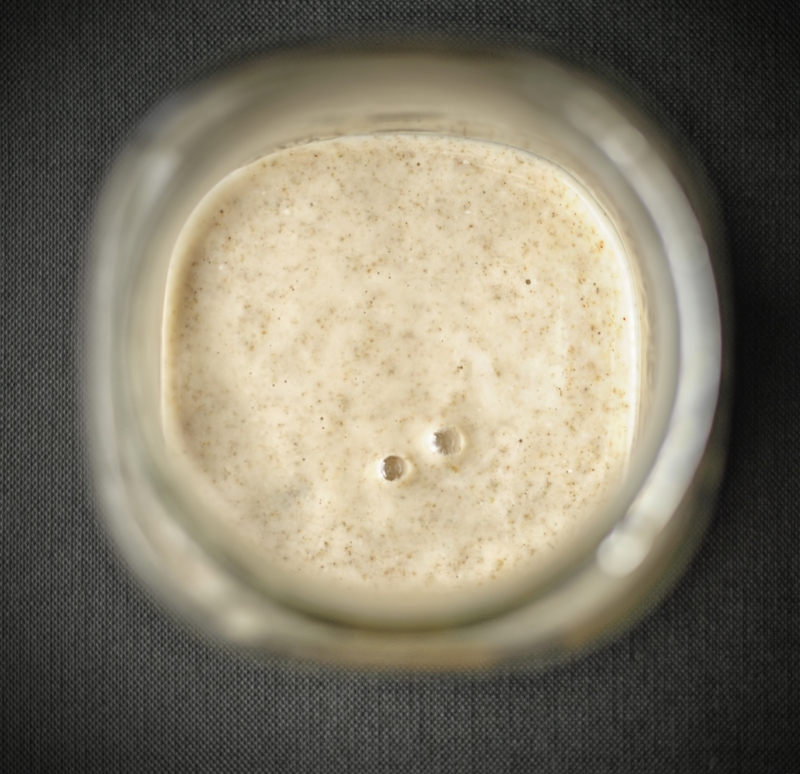 Frank is a bread dough starter made with some key ingredients, two of which I had no idea could or should, be used in a starter (or leaven as this particular one is called). Most starters are made with simply flour and water. 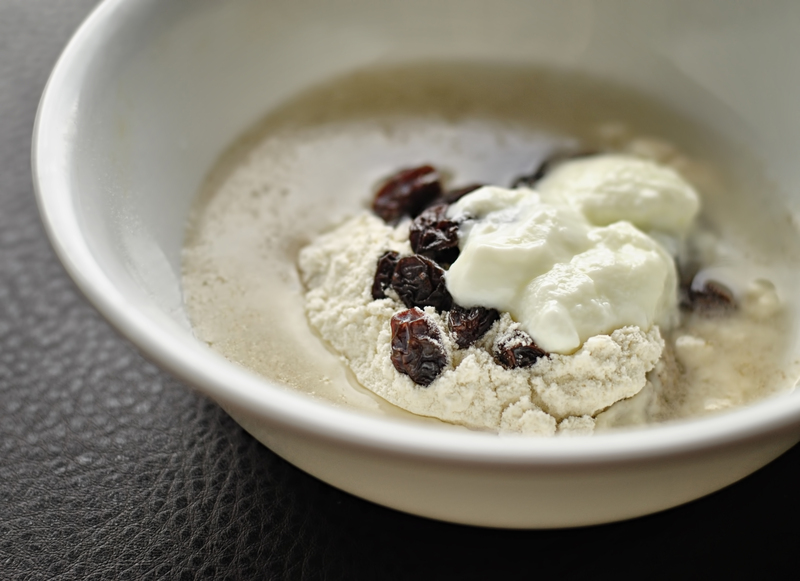 This particular leaven is made with water, rye flour, bread flour, low fat live-culture yogurt, and… wait for it… RAISINS. Yup. 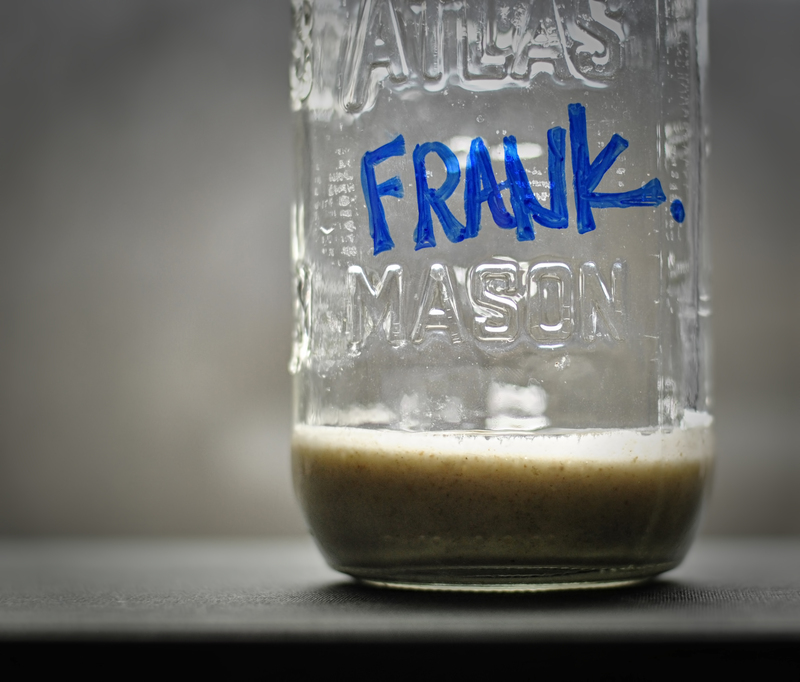 Yesterday Frank was just rye flour, bread flour, and water, with a little pinch of yeast to get him started. But I decided this morning to throw ‘old Frank’ to the bin, and create ‘new Frank’ following the proper instruction of yet again, Dan Lepard, with these more interesting ingredients. So yes, today’s Frank is actually Frank 2.0 – He’s also not aware that he’s adopted, so keep in on the down-low. From what I’ve read- Frank will most likely not change much over the next day or two, he’ll probably just sit around looking puddle-like and still for the next 48 hours. Sounds nice doesn’t it? With all this ear-bleed balcony-drilling that’s been going on outside my apartment window for the past eight weeks, sitting around all puddle-like and still for 48 hours (aka: REST) sounds absolutely glorious. And out of reach. Over the course of the week, Frank will be fed small amounts of water and additional flour in order to keep growing, or ‘spawning’ as I prefer to call it. Sounds creepier. He’ll be used to make crispy-crusted, tasty loaves of bread (eventually). And after having come across this blog —–> http://apinchofdirection.com/?s=bread+starter <—– – I quite like the idea of this Pet in a Jar being evil. Or at least potentially so. Let’s keep it magical, shall we? Frank’s Grandfather was featured on a 1998 episode of Pinky & The Brain, as they tried to take over the world as a trio. Or wait, maybe he wasn’t. I suppose drizzly, rainy, Monday’s allow cartoon clips of the 90’s to creep into my thoughts. Or maybe Pinky & The Brain are just really, that awesome. The real, honest (sad) truth, is that I actually named Frank, the Pet in a Jar, after a Disney cartoon character. Yes, I did. His Name is Frank because of my most favourite Disney character from the movie The Rescuers Down Under. If you are not familiar with this gem of a flick; I feel terrible for you. Get yourself some popcorn (and maybe some wine), and get yourself caught up to speed. Pronto. I feel a particular bond with Frank because of his genuine appreciation for Freedom. Anybody who isn’t interested in dedicating an entire hour and a half of your day to watching old kiddie cartoons, simply for the purpose of following my ‘story of Frank the dough starter’, can click this link to see who, in the bloody hell, Frank the Lizard from The Rescuers Down Under is —-> http://www.youtube.com/watch?v=R-1mK0TgxDA <—– . Bask in the glory of Freedom with him, for a moment. Anyways folks, that’s all for today. As you can see; when there’s not much ‘bubblin’-in-a-jar’ going on, it leaves only WB and Disney characters to discuss. We should probably put an end to that one, real quick. Stir ingredients together, pour into airtight sealable jar, leave at room temperature (about 68 F) for 24 hours. And… tune in next time for step two. See- it’s already brain-numbingly easy, right? Previous articleFoodBack to Basics: Reasons for Making Your Own Bread. Next articleFoodPickle Juice Bread: Drooling & Appreciating Life's Little Things.